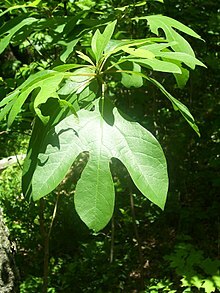 Sassafras is a genus that contains three current and one extinct species of deciduous trees in the family Lauraceae. It was originally in eastern North America and eastern Asia. Sassafras trees grow from 9.1–18 m (30–59 ft) tall and from 7.6–12 m (25–39 ft) wide. The trunk grows 70–150 cm (28–59 in) across. "Sassafras" was named by the botanist Nicolas Monardes in the 16th century. It is said to be a corruption of the Spanish word for saxifrage. Sassafras albidum - Eastern North America, from southernmost Ontario, Canada, through the eastern United States south to central Florida, and west to southern Iowa and eastern Texas. Sassafras tzumu - Central and southwestern China. ↑ 2.0 2.1 Nie, Z.-L., Wen, J. & Sun, H. (2007). "Phylogeny and biogeography of Sassafras (Lauraceae) disjunct between eastern Asia and eastern North America". Plant Systematics and Evolution 267: 191–203. doi:10.1007/s00606-007-0550-1. ↑ Dirr, Manual of woody landscape plants. Page 938. This page was last changed on 21 August 2013, at 10:42.